この日のプレジデント、スーツ姿に頭はバンダナ巻きで登場。あれっ? 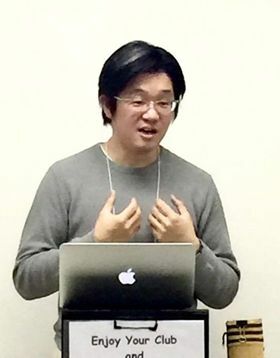 と思っていると「スピーチはトライアルとエラーの繰り返し、失敗を恐れるな!」と言いながら例会をスタート。バンダナを巻いてみたけど (トライアル) 失敗だった (エラー)、というデモンストレーションだったのです。いつもいろいろ趣向を凝らして例会をスタートするプレジデント、さすがですね。バンダナ姿も似合っていましたよ! 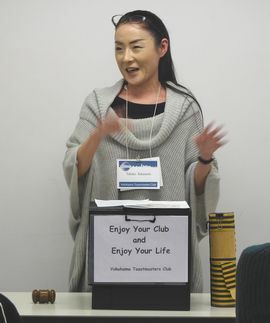 The 641st Official Meeting of Yokohama Toastmasters Club was held on April 15th, 2017, at Hatoba Kaikan inside Zou-no-hana Park, which was fragrant with beautifully blooming spring flowers. 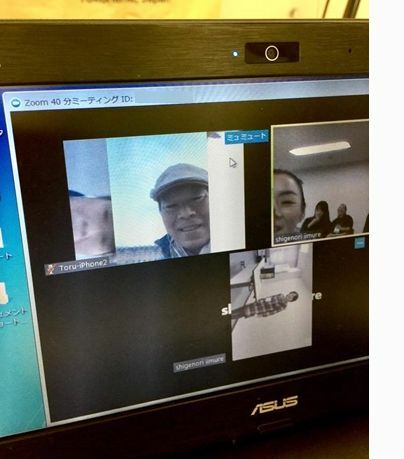 Around 30 people attended the meeting, which includes six guests, Area Manager TM J, and our Vice President of Education who joined from England (via Zoom system) this time with his friend (he joined from Paris at the last meeting). At the beginning of the meeting, our President TM I took the podium wearing bandana around his head, which surprised us all as he usually wore business suits only. Then he said, “Making errors and trials makes a good speech. Don’t be afraid of making errors!” His unusual attire meant to be the demonstration of ‘Trial (wearing bandana) and Error (it was a mistake!)’. He always makes an interesting ice-breaker like this when he starts a meeting. Good job President, the bandana suited you well! 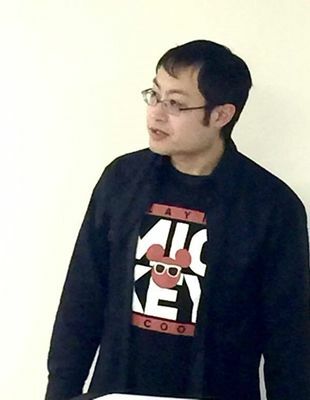 After the impressive starter, Mr. S, who came from Osaka, was inducted into our club. Enjoy YTMC Mr. S! The Word of the Day was introduced by a pinch-hitter TM Y. She chose ‘vernal’ for it, a good choice for fresh spring! The Induction Ceremony was over and the time came to start a main session. TMOD of this meeting was assigned to me, who had done this job many times in other TMCs but never done it at YTMC. It’s always quite unnerving to do things for the first time in public, but I somehow managed and did my best. There were some members who made a last-minute-cancellation, but TM G took a role of Grammarian and TM N performed as Timer. Thank you both for your cooperation! The main session started with the Workshop conducted by TM T. The title of it was “Know Your Audience”. She spoke about the importance to know the audience before making a speech in crisp and organized manner. Knowing the audience’s age demographic, profession, tastes, hobbies, etc. makes a big difference like it does in business occasions. The Table Topic Session was facilitated by TM N. S., who is always fun and precise. He was impressed by the Workshop done by TM G at the previous meeting, and tried his best to give each speaker an easy question to answer. TM T’s answer to the question, “The world is about to end in a week. How would you spend the final week of your life?” was “I’ll go to ‘Ohanami (cherry blossom viewing)’!” Attaboy, TM T! 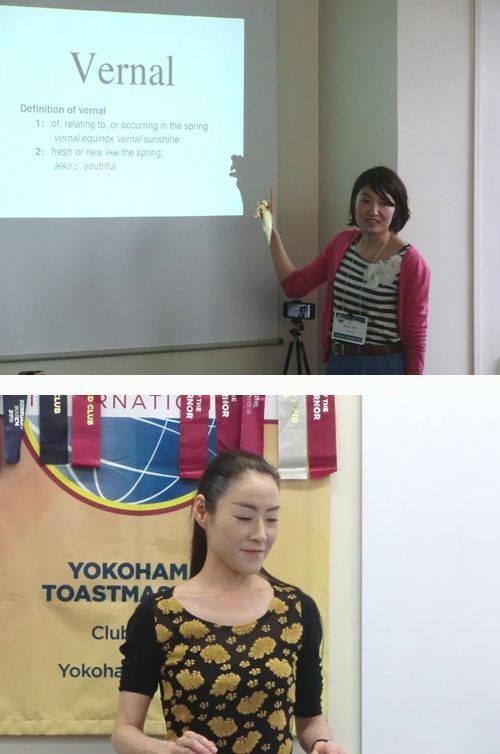 We had four speakers in the Prepared Speech Session. Every speech was profound and made us think deeper about the subject. The first speaker was TM M, who talked about how to touch the hidden side of human hearts in his speech titled, ‘Heart Touching’. Despite the serious topic, he gave his speech humorously with gentle smiles. The third speaker was TM K, who is one of the most enthusiastic speakers of our club as he makes a speech at almost every meeting. His speech title this time was ‘Read Between the Lines’. He talked about how important reading between the lines is by introducing anecdotes through his love relationship experiences in the past (or in the present?!). The most unique feature of his speech was revealed when he closed his presentation by showing us the sales forecast chart that had three lines and gaps in-between and he said, ‘You see? Reading between THESE LINES is important!’ What a unique idea! The finale of the Speech Session was performed by the fourth speaker, TM H, a pretty PhD student from Vietnam. Her speech title was intriguing ‘An Exception of Murphy’s Law’. She introduced us the series of funny misfortunes that happened to her during her trip. However, despite these misfortunes that seemed to be following the Murphy’s Law, she was able to finish her trip without another mishap, which made her think the Murphy’s Law got to have an exception. 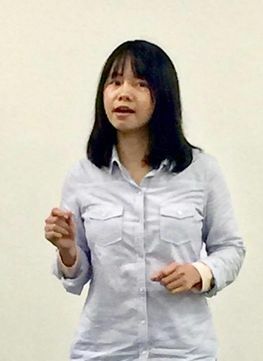 Every time the scene changed, she strongly stepped forward to the audience, which made me think she successfully accomplished the objectives of her speech, ‘Your Body Speaks’. The Evaluation Session was conducted by TM N, who did it for the first time. At the opening, she introduced an article she’d read recently and said, ‘Practicing alone won’t improve your skills. The most important thing is to get feedbacks.’ Her icebreaker was quite appropriate as an opening to the Evaluation Session, which is in fact a feedback session. Not only she gave each role taker feedbacks, but also she gave four evaluators good advice. Her evaluation was on the mark and her sense of humor was brilliant. All in all she didn’t look like a first-time General Evaluator. Good job TM N! As for the four evaluators, although evaluating speeches on the spot is the most difficult of all roles in TMC meetings, all evaluators in this meeting did it amazingly well. After the Evaluation Session, TMOD (me!) gave the evaluation to the performance of General Evaluator (in the way written above). One thing I regret is that I couldn’t give her enough time to give each evaluator more thorough evaluation. The finale of the meeting was of course the Award Presentation. In this meeting, I suggested that we go crazy sometimes, so the speakers who went overtime were also made eligible for the award competition. The Best Table Topic Speaker was awarded to TM S, who had just joined the club on this day, The Best Speaker went to TM M, and The Best Evaluator was given to TM I. Congratulations all of you! Lastly, I’d like to thank all the officers, members, and my mentor who kindly supported me in fulfilling my big task for the first time. Without you I could never have finished my job and would have gone home crying…thanks to you all it was such a fun meeting filled with happy laughter and smiles. Thank you again and see you at the next meeting! Meeting#640 on April 1st.2017, the day of April was held on Yokohama-youth near Sakuragicho-station. We had 2 guests and the number of participants were less than usual but the meeting started smoothly with warm atmosphere. 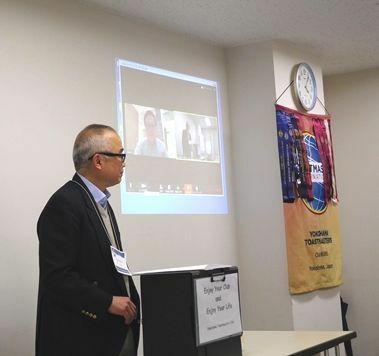 Our Vice President of Education, TM Nakanishi joined today’s meeting via Web from Paris.Although we were not able to hear his voice clearly, we able to see and enjoyed the view of city, Paris. Today, TM H challenged [Word of the day’s] role first time and he introduced us the word ’upbeat’. Several members used this words during the meeting. Today’s joke master was TM F. He entertained us with 2 unique stories. 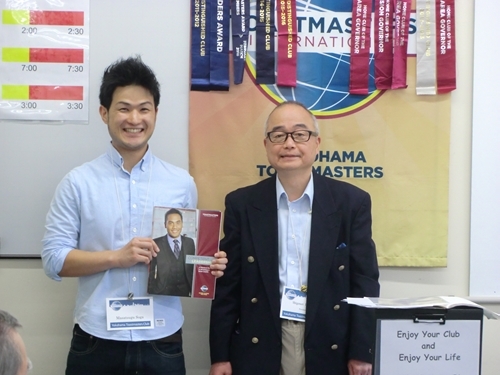 Next Tips session, TM G provided us many useful tips about Table Topicmaster using Toastmaster magazine. Today’s Table Topismaster was one of the very experienced members, TM T. She gave us 4 questions related to Spring and a first year of school. The question which I liked was ‘On the day of the entrance ceremony, you as the president of university have to make opening remark to new fresh students. What would you say? What would you tell them? And TM S answered this question. In the past, I haven’t imagined the situation that I am a president of University, so it was very difficult but thought-provoking question for me. In today’s speech session, we had 4 speakers. 1st Speaker, TM O was very new member and it was his ice-breaker (first speech) today. Even so, his speech was well prepared and he gave us great introduction’s speech about him. 2nd Speaker, TM T made us very heartwarming and dramatical speech about her experience with his boyfriend. Her speech’s message’ leave work stress behind’ was very clear and strong. 3rd Speaker, TM K gave us an interesting speech about his trip to New York with his grandmother. Based on his project manual, he showed many pictures as visual aid during his speech. Not only his speech itself, I also enjoyed his many pictures. Last speaker was TM I who is one of the very experienced member in our club. His advanced manual was Entertaining Speaker and his unique speech was about his experience during his trip with family. Although he faced on big trouble at the immigration of US, he successfully flied on to Hawaii and then went back to Japan safely. The story was very interesting and exciting. During the evaluation session, each evaluator made a great evaluation for their speakers. Especially, TM S provided very effective and appropriate advisements for TM I to make his speech better. Today’s General evaluator was TM F and it was his first challenge to be a General Evaluator. So that, he prepared a lot before the meeting and during the session, he gave us many comments. I felt he was very nervous to challenge this role but I am sure he will be a great General evaluator next time! 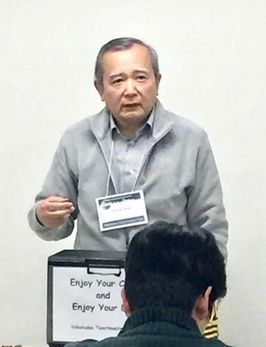 TM N.Sakamoto who was Grammarian also provide many useful and informative grammatical report. Today’s meeting was finished without any big issue and all members had a chance to speak and talk at least one time. Some members took double roles and helped each other’s. Thank you so much for your big support to make a great meeting!! !